Every company wants to see their budget come through with both an excellent ROI and the best possible results when it comes to their out of their investments in digital advertising. The Funnel Advertising Methodology, created by Cyberclick, can help you with these objectives. We took the classic conversion funnel from the world of advertising and developed an innovative way of looking at it: flipping it upside down! Furthermore, for each stage of the conversion funnel we will propose the best marketing actions. When you apply the Funnel Advertising Methodology, frustration over campaigns that simply do not work will be alleviated because you will see results right from the start and get a better ROI! Consumers will find themselves more attracted to your company, especially since you will be offering content they enjoy. In doing this, you will entice them to come to you, instead of you going to them. By using quality call to actions, you will be able to effectively guide consumers to conversion. Using the same budget you might have used on more traditional marketing methodologies, you will see an increase in conversions. Brand recognition will be reinforced tenfold and you will be placed at the ‘top of the user's mind’. 2. What is Funnel Advertising? The prime objective of the Funnel Advertising Methodology is to impact users through quality content at the most opportune time, adapting over time to fit the client’s needs – depending on where they fall in the buying process. In stark contrast to the planning of traditional methodologies, the Funnel Ads Methodology innovates, starting with online marketing procedures at the bottom part of the conversion funnel, (where the consumers are closer to making a purchase), later continuing up through the higher stages. The end result hopes to see that the advertisement we send leads a consumer to a predetermined action that qualitatively accompanies them up until the final conversion. Buyer Persona. The creation of a semi-fictitious profile of the ideal client for your company. Conversion Funnel. The stages a client must pass through to arrive at the final conversion. Segmentation. The secret lies in the way in which you divvy up (segment) the audiences for your campaigns. The implementation of a methodology based on the user’s needs throughout all the different stages of the buying decision process is paramount for getting the maximum performance out of online marketing. 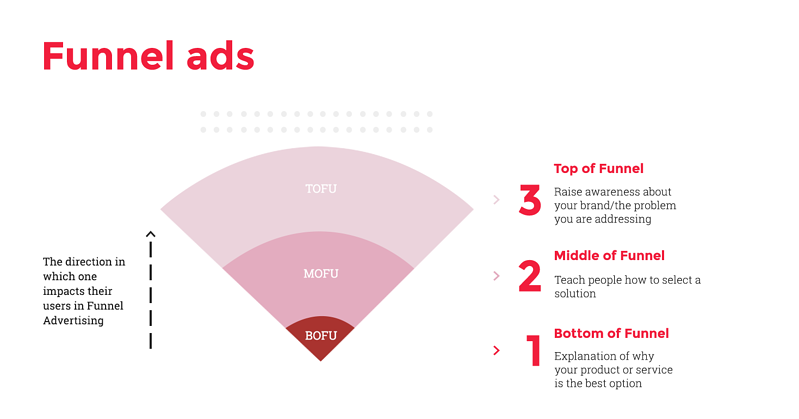 An agent of conventional means would implement a campaign stemming from awareness and would put a lot of emphasis on the TOFU stage because, before having digital 'options', the possibility of directly impacting clients at the bottom end of the conversion funnel simply did not exist. Back then, when one was close to making a purchase decision (BOFU), you could only impact the consumer in a store via the Point of Sale (POS) Display, comprised of display cases, posters or any other elements which may have acted as an advertising messenger. It was difficult then to glean information about clientele until they either showed up at a store or did not. Only then could one know where in the buying process a customer was actually at. 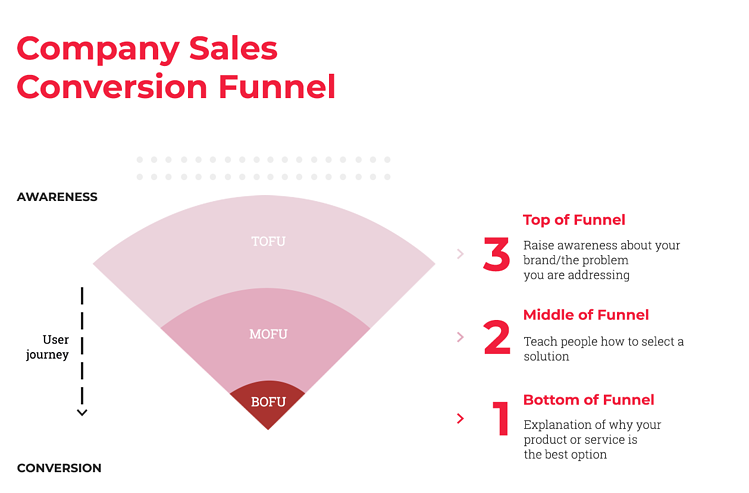 The Funnel Advertising Methodology is characterized by launching campaigns from the part closest to the client conversion, that is, just before the BOFU. When we put emphasis on the Bottom of the (conversion) Funnel, we go directly towards the people who are extremely interested in the company, product or service. These clients have a very clear need and are prone to conversion, hence why they are at the final stages of the purchase. The probability of closing the sale is high within this stage of the Funnel Ads Methodology and, therefore, we pounce on the chance of a achieving a higher conversion rate. The MOFU and TOFU stages don’t get left to the wayside, rather they are more effective in subsequent, new campaigns, better suited for these stages. From here, one can hunt for new audiences who will be guided down the traditional road towards conversion, passing through all the stages of the Buyer Journey on the way. 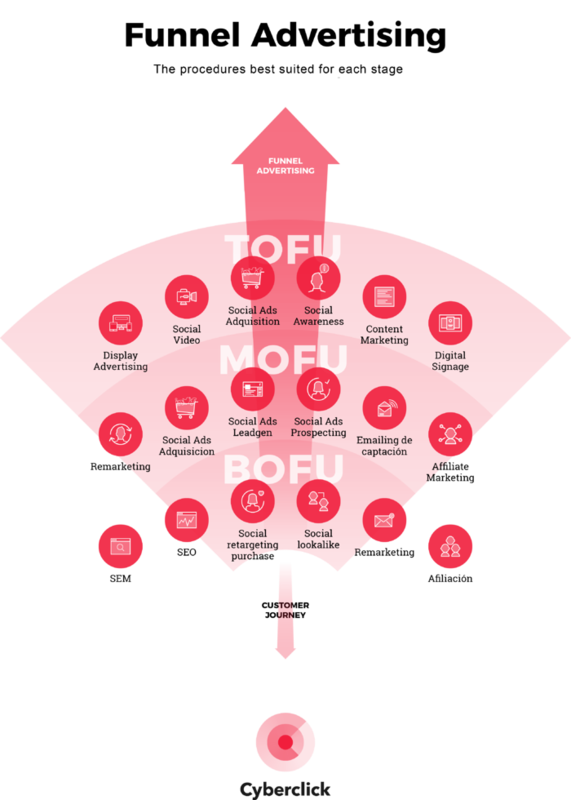 We have also devised our own methodology included within the Funnel Advertising system which consists of impacting people, via TOFU and MOFU, who were first impacted at the moment closest to purchase and, subsequently, resulted in a conversion. In this way, customer loyalty and/or the cross-sale is achieved. In short, we will do an inverted 'climbing' of the funnel in order to continue to grow. We first look for the final client in the BOFU zone so that later we can continue to attract new consumers who have yet to get to know us; they can become interested in us at the Middle and the Top of the Funnel. In this manner of working with the Funnel, ROI will be better and costs can end up being much lower in the medium and long term.